Real Estate Lawyer The Bronx: Who Needs One? Buying, selling, and leasing real estate can be some of the most fun and frustrating investment transactions one encounters in a lifetime. Some of the fun aspects are buying a home for the first time, refinancing a mortgage to reduce monthly payments, or selling a starter home to buy the home of your dreams; leasing out rental properties can be fun, too, because they are an investment that provides a home and a shelter for other people in the community. The less fun aspects of real estate include the copious amounts of paperwork, the nitty-gritty details that can make or break a deal, foreclosures, and deed transfers following a death in the family. While all of these transactions can be performed without the help of a real estate lawyer, the pursuit of these actions alone can mean additional hours spent pouring over paperwork, meetings with agents and banks to discuss detailed contracts that are barely understood, or failure to recognize a bad deal and sign on something that is less than favorable. 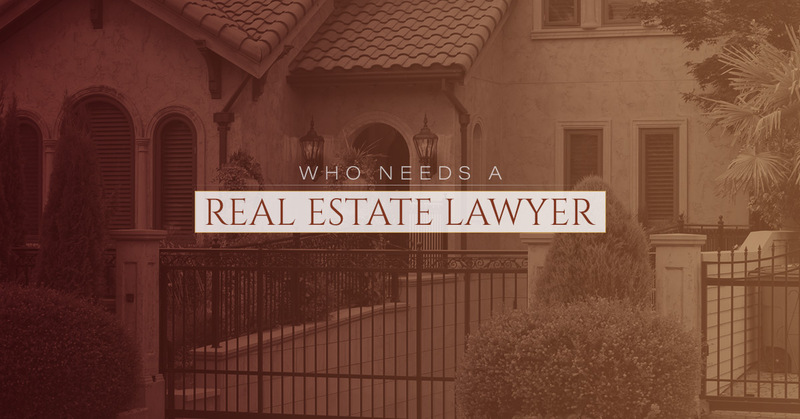 So, while nobody really needs a real estate lawyer, it can be greatly beneficial to have a legal expert supporting you through these life-changing transactions. You are buying or selling real estate – Real estate lawyers can facilitate the entire process, including writing and reviewing all contracts, coordinating financing, performing title reviews, and attending the closing. An engineer is inspecting your commercial or residential property – Inspections can reveal necessary information about the property you are purchasing. A real estate lawyer holds the engineers and inspectors accountable to find and report any and all possible problems. You need help securing financing – Many people need financial assistance to acquire the necessary capital for purchasing a home, building, or investment property. A lawyer can help interpret and provide advice to negotiate terms of financing agreements. You are crunched for time – Working and dwelling in NYC likely means you’re a busy bee with little time to spend scrutinizing documents and attending inspections. To help alleviate pressures from you, a real estate lawyer can review documents and attend necessary meetings on your behalf. You need to transfer a property deed – Including inter-family deeds with life estate plans, a real estate lawyer can provide legal leadership for transferring a property deed from one party to another. You are interested in refinancing – Whether you want to refinance to lower monthly mortgage payments or to get a lower interest rate, a lawyer can help navigate this pile of paperwork with your financial interests in mind. You want to defer property gain taxes through a Section 1031 Exchange – To avoid a taxpayer paying taxes on a “paper” gain, a real estate lawyer can help an investor file a Section 1031 Exchange. This defers payment on federal income taxes and some state taxes during the transaction period. You want to use a partition action – A real estate lawyer can help a group of people who live in units divide the property title into individual shares among the owners. You want to prepare or review a lease agreement – As with many other legal real estate services, a lawyer can help landlords prepare a lease agreement for investment rental properties or a tenant review a lease agreement for fair terms. You must foreclose or modify your mortgage – When facing foreclosure, it is worth visiting with a real estate lawyer about other options, including modification. Lawyers can also help negotiate to get you the best deal during this tough time. If you fit into any of these shoes, it is in your best interest to work with a real estate lawyer. The Law Offices of Diron Rutty, LLC, is dedicated to protecting your rights. We have offices located in The Bronx and Poughkeepsie, NY.